LINCOLN, Neb. 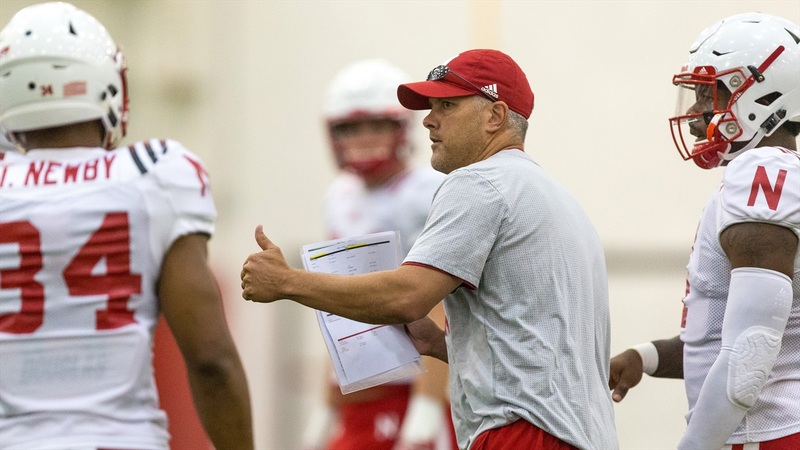 – There is one question on every mind in Husker Nation, and that is “What the heck is going on at the quarterback position in Lincoln?” Offensive coordinator Danny Langsdorf provided an update on Tuesday night. Tommy Armstrong Jr. and Ryker Fyfe both participated in practice and Zack Darlington continued to get some snaps at quarterback as he has been recently. To help Armstrong return to the field after suffering a hamstring injury that kept him out of last week’s win against Maryland, Nebraska essentially attached an “artificial hamstring” to his leg to help reduce stress on his actual hamstring. To get to where he is now, Armstrong has been spending a lot of time with trainer Mark Mayer. Never one to lack confidence, Armstrong said he thinks he’s ready to play right now, although the coaches said the decision will go right up to game time. >> Langsdorf also offered his early evaluation of the Iowa defense. >> Senior wide receiver Alonzo Moore did not practice and is day-to-day. >> Defensive coordinator Mark Banker provided a comprehensive breakdown of what he expects to see from the Iowa offense. "They're big and strong up front, the best coached offensive line technically, technically sound, that we’ve seen,” Banker said. “They are very stick-to-it-ive with the run game, we saw that out of them last year as well plus you see it on tape. They believe in it, they're going to stay with the same play where they get no yards or two yards knowing that they’re going to break one eventually. The other part of it is obviously who’s carrying the ball. 29 [LeShun Daniels Jr.] and 25 [Akrum Wadley] are both more than capable backs. 29, he’ll hammer you. 25 has really improved over the last year. They kind of only used him in the outside game and in the passing game, and they're using him on a full-time bases. Between the two of them, they have about 1,700 yards and about an equal amount of carries; 29 has a few more. >> Senior safety Nathan Gerry evaluated how safety and nickel corner Aaron Williams has done early in his career. Like Gerry, Williams played right away as a true freshman. >> Finally, Armstrong offered his take on whether or not Nebraska has a rivalry with Iowa.